Tracy Mygatt, one of the founding members of WRL, speaking at the dinner for Jeannette Rankin, NYC 1958. 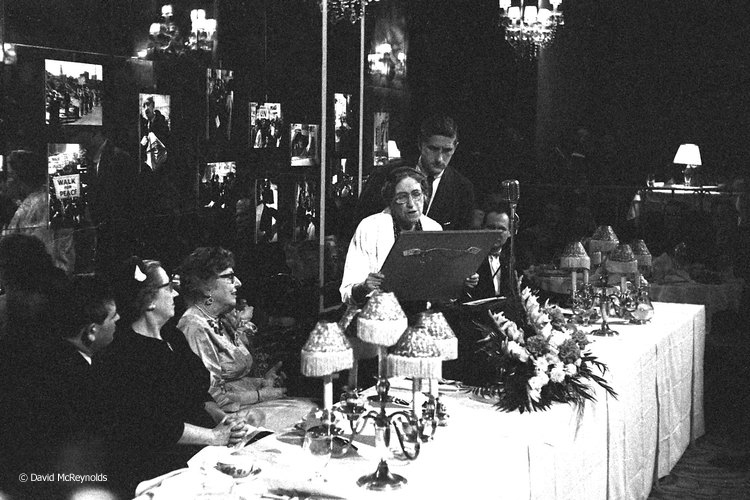 Tracy Mygatt, with WRL Chair Roy Finch behind her, presenting the award plaque to honoree Jeannette Rankin, NYC 1958. 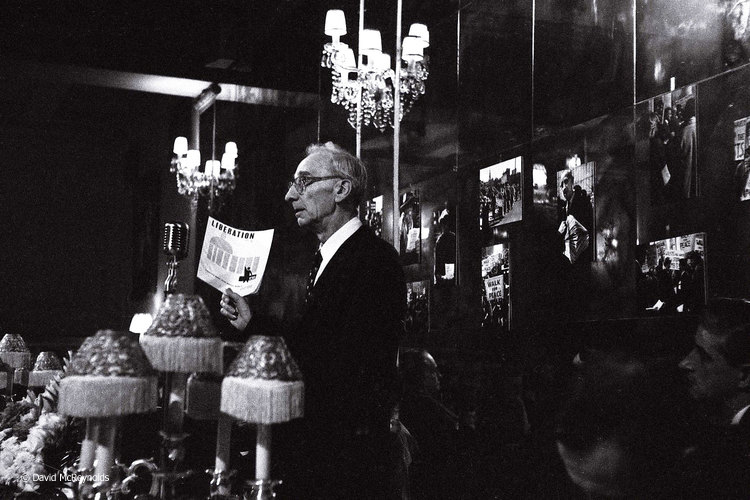 AJ Muste, a founding editor of Liberation Magazine (1956-1977) at the peace award dinner, NYC 1958. Longtime WRL staff member Ralph DiGia at the peace award dinner, NYC 1958. 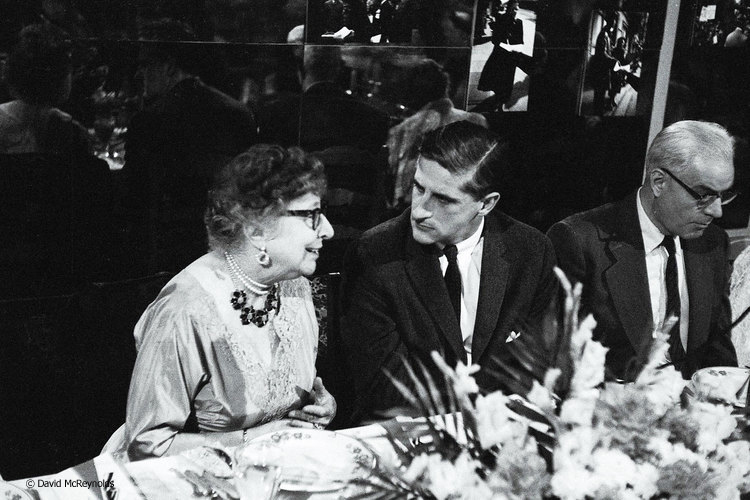 Larry Scott and Robert Gilmore, peace award dinner, NYC 1958. Martin L. King was the keynote speaker at the 1959 WRL peace award dinner honoring AJ Muste. AJ Muste and Norman Thomas at the 1959 WRL dinner. Muste received the 2nd Annual Peace Award. Bayard Rustin at the 1959 WRL peace award dinner honoring AJ Muste. Barbara Deming (left) receives the War Resisters League Peace Award in 1967. Artist Janet Toy presented the award. Barbara Deming (left) presented with the 1967 WRL Peace Award by artist and WRL volunteer Janet Toy. Ralph DiGia speaking at the 1967 WRL Peace Award Dinner where Barbara Deming, seated, was honored. Harold Fackert, WRL volunteer, speaking at the 1967 Peace Award dinner. Barbara Deming spoke after being presented with the 1967 WRL Peace Award. Igal Roodenko is in the background. Bayard Rustin with Igal Roodenko. Igal received the 1979 WRL Peace Award. Don Judd, right facing camera, hosting an art benefit for WRL at his Spring Street gallery in Manhattan. Feb. 1, 1986. WRL staff member Karl Bissinger organized the art benefit with Don Judd. Pictured with Karl are WRL staff member Ed Hedemann and children's book author and WRL committee member Vera Williams.